STRUMIS is delighted to welcome Global Metals Corporation Products, Inc. as a Client, back in 2009 following their decision to invest in the STRUMIS steel estimating system. This case study explores the quality assurance and business benefits delivered through the implementation of a technology based process such as that provided by the STRUMIS estimating system for steelwork project tendering. Global Metals Corporation is a technology driven structural steel fabricator based in San Diego, CA that focuses on providing value-added solutions to the commercial, military, public works and solar construction industries. This technology focus and a commitment to quality led them to research process driven solutions for their estimating department. 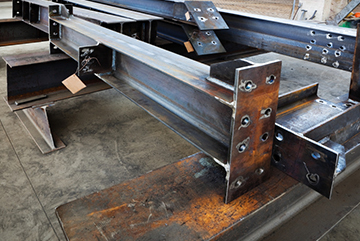 As a certified AISC and LA City fabricator, Global Metals Corporation has made its mission to exceed the industry’s QA (Quality Assurance) standards at every stage of a project. To achieve this Global Metals Corporation's QA Plan is based on accessibility, accountability and monitoring, which has resulted in a process driven environment across each department. The STRUMIS system is based on process driven task based wizards and is developed from best practice steelwork fabrication experience enabling companies to implement systems and benefit from efficiencies, enhanced productivity and traceability. This approach mirrored and complimented the commitment that Global Metals Corporation have to QA and the Global Metals Corporation team were able to see immediately how the STRUMIS estimating system could provide the technology process required to deliver consistent and accurate estimate proposals. A spokesman for Global Metals Corporation commented; ’we were impressed by the scalability and framework provided by the STRUMIS system which covers our current requirements for estimating and tendering, and integrates with our other systems’. As the steelwork construction industry becomes more process driven, there are more opportunities for those companies that adapt first and make quality a priority. Today simply being the best alone is not good enough! To be considered by many main contractors you need certification. The STRUMIS management and production system can give you the framework to implement processes rapidly and at the same time can deliver tangible benefits in the running of your business. Business Development Manager commented, ’we are delighted to work with Global Metals Corporation, an exceptionally well run facility that benefits from the process led approach within the STRUMIS system’. Since 1997, Global Metals Corporation Products, Inc. has been a recognized leader in the design, fabrication and installation of steel. A certified small business with design-build capabilities, Global Metals Corporation is a technology driven steel fabricator, with a core business culture of quality and safety. The management team at Global Metals Corporation prides itself on taking a collaborative and personal approach.